Grapes, and one of their products, the wine, give us pleasure during the whole year. Here I will introduce some kigo related to this fruit. 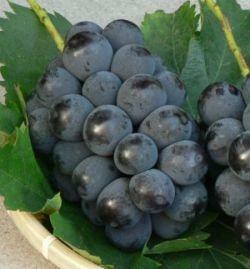 The origin of the grapes is probably Western Asia, but now it is grown almost everywhere in the world. In Japan, grapes were introduced during the Heian period in a special way, using separate shelves for each plant. Now the region of Kooshuu 甲州 in Yamanashi is maybe the most famous wine-growing area. In my area of Okayama prefecture, Japan, huge pione grapes are grown for eating (or rather giving away as presents), since they are extremely expensive. The flowers are very small and of a yellow-greenish color. They look almost like the stem, but they have a faint sweet smell. They are extremely delicious and loved by the wild animals too. 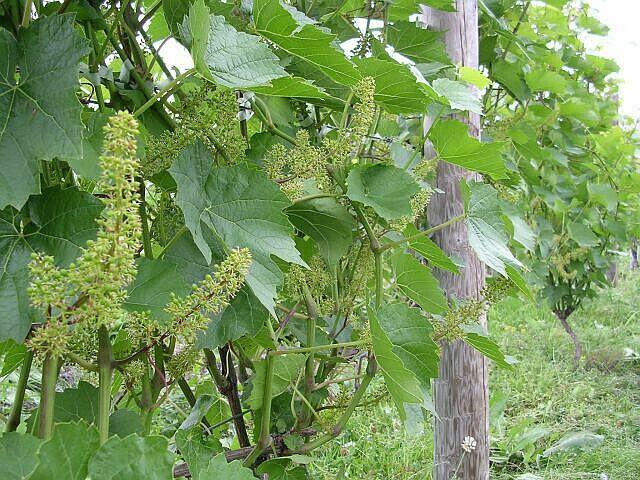 They can grow in colder areas than the usual grapes. In autumn, they also show a lovely red color of the leaves. When ripe, the small fruit are almost black. They make a delicious wine out of it in my area in Okayama, Japan. You can only drink it when someone gives a bottle as a present, it is just tooo expensive. hebibudoo / jabuoo 蛇葡萄（へびぶどう）"serpent grapes"
The history of wine in Japan goes back to the beginning of the Meiji Era (1868-1912). At that time, young grapevines were imported with official encouragement from the government and winemaking was attempted. However, it was difficult to adapt it to the Japanese climate and almost all attempts at growing grapes or making wine ended in failure. In 1890, Kawakami Zenbei set up the Iwanohara Vineyard in Takada, in snowy Niigata Prefecture and three years later, using grapes he had harvested with his own hands, began making wine. 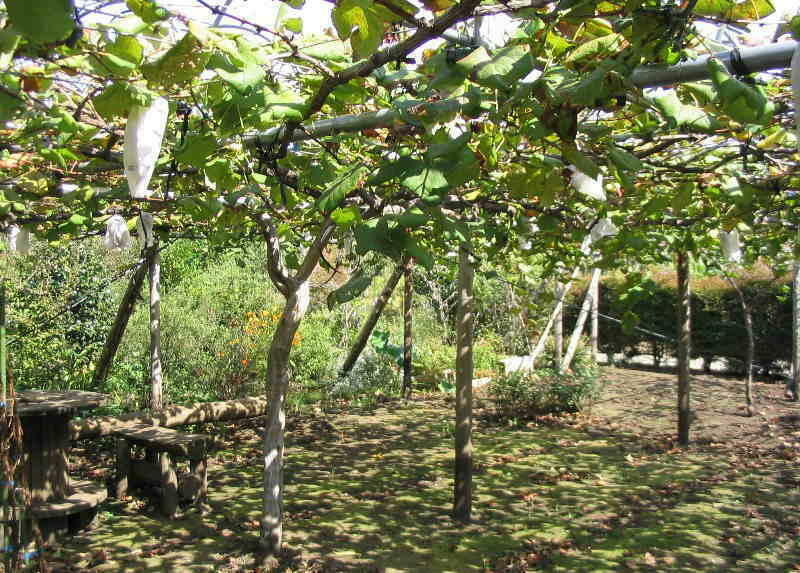 Legend has it that grape-growing began at Yamanashi, where is major wine and grape produce region now. Wine may have been made from local grapes in Yamanashi in early times and consumed very locally. Yamanashi has the least rainfall and less fatalities soil, therefore rice can not be grown in Yamanashi. It is not difficult to assume that people live in Yamanshi compelled to drink wine instead of rice wine called "sake" which is more popular alcohol beverage. In 1875, the first commercial winery was established in Katsunuma, Yamanashi, which is now a part of Mercian winery which is the second largest company in Japan. As Mt Fuji provide rain shadow effects in Kofu Valley, Yamanshi has the least rainfall in Japan. But it still has excess 1000mm annual and 800mm rainfall during growing season. Especially, flowering season, in June and early in July is a monsoon season, this causes serious downy and powdery mildew problems. Worthily, just before harvesting, in September, we have typhoon season, sometimes it causes wind damage as well as bunch rot problems. Excess water and fertile soils makes vine vigorously, grape quality can be reduced without careful yield control. Der Herbst reift ins Jahr. For a village like Nizas in the heart of the Midi in the South of France, the "vendange", the havest, is the most important time of the year. 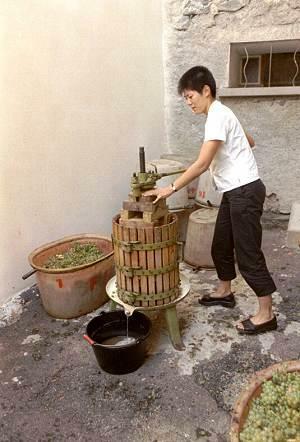 The photos are of Akiko, a young lady from San Francisco who stayed with us for a week and was determined to do the vendange. Most picking is by machine, hand picking is one of the hardest jobs on this earth, no farmer here would employ a 'dude' ranch person even if they paid the farmer for the week. It has been tried and failed, now the quality grapes and the production are too valuable. Teams of hand pickers used to come from Spain, now it is eastern Europe, pay is $5 per hour for a 10 hour day starting at 7.00 am, you are bent double most of the time, unless you are used to it a beginner very rarely gets to the second day. The best thing is to come and watch and drink last years harvest to make room for this years. The French phenomenon that the size of the tractor is inversely proportional to the driver is evident everywhere as the miniature vineyard tractors haul huge trailers full of grapes and these are driven by giants of men who look as if they could carry the toy tractor back to the farm in their pockets. From five in the morning until after midnight, the machines are in the vines driving over the rows with their floodlights playing in the fields. These machines 'whine' like a lost banshee as their hydraulic systems are driven at full throttle. I have written a few times about "the vendange", the grape harvest. I am getting many letters from readers asking if they can come to France and spend happy days picking grapes and pleasant evenings sitting at rustic tables eating fresh bread and cheese with friends and singing songs until the wine jugs are empty. The vendange will start soon, but the reality is less romantic. Officially no one can get casual work without being registered, most grapes are now picked by machine and there is nothing romantic about a giant blue or yellow contraption like something from a Star Wars movie thundering along the vines and stripping them of the grapes by the ton. The few remaining vineyards requiring hand picking are often jealously guarded by the regular workers. By the evening after 8 hours of hard work for a fixed rate of 42FF (US60c) an hour, the last thing most vendangers want to think about is a jug of wine and a sing song, a hot bath is more likely. So now the grapes are nearly in, we wait with bated breath for the wine festivals. A continuous series of overindulging in speeches by every Mayor in the region and all the officials from every winery plus all their assistants, various other people wearing very bad suits and atrocious ties, some almost sober entertainers and more speeches. This will happen in every one of hundreds of villages in the south of France from mid October for about eight weeks. After these illuminating speeches there is unlimited food and drink supplied free for all who remained awake. The trick is to arrive not too late to be rude, but late enough to miss at least a couple of hours of speaking. My friend and Jazz saxophone player, Terry Thompson, has this technique of optimum arrival time down to a fine art. It is important to get to the groaning tables at just the right time. The wiser and older villagers know which bottles are worth drinking and you see them sidle up to these with deft movements they flick the best bottles closer to their reach so that when the talking has ceased and the applause had subsided, they are in position to get the first of the best. Fortunately these festivals are staggered (a very apt word) so you can go from one festival to the next for almost two months and eat, drink and be "merry" to your heart's content. Then there are the new year celebrations to prepare for. In October, even cityfolk get to enjoy sweet wine in (sometimes open air) locales. A whole range of urban folklore has flourished in connection with this Must.